Manifesto: Noun. A declaration of one's intentions. I may post some or all of my entries in this blog. Other artists are doing this with me, and you can see their work here!. Or you may join us here!. "The Prestige" is a great film. It's one of the most inventive and engaging films I have seen in a long time. A tale of two rival magicians, it twists and turns before reaching the end. I have to admit that I had it figured out about half way through but there were still little surprises. This is a definite buy when it comes out on DVD! It seems like ages since I've updated my blog. I've had plenty of things to say but hardly any time to write it down. I started back work today after a lovely long weekend in Edinburgh. On Friday, we caught up with Heather and Faith. Both seem to be doing ok. Heather is much happier now that she has things settled at work. After that, it was off to indulge in the ritual of Jimmy Chungs with Kat and Doug. It was great to see both of them and we ate our fill of lovely Chinese food. Then, it was off home to Whitburn in the pouring rain. We spent the Saturday and Sunday at Mum and Dads. I really enjoyed myself. We went shopping during the day on Saturday. I bought loads of cheap goodies for the house from Matalan (our nearest in London is Brent Cross) and Graeme got some new shoes. On Saturday night, my friends visited and we had a "few" drinks. It was a great laugh and fantastic to catch up with them. On Sunday, we went to New Lanark and the Falls of Clyde. Graeme had never been before and I wanted to share one of my favourite places with him. It was cold but still sunny and the place was as beautiful as ever. 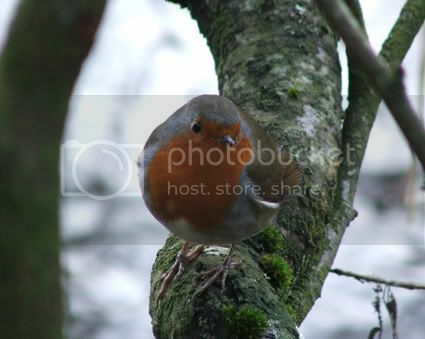 We got some lovely pictures including the one of the Robin above. We met him walking alongside the river where he was perched on a tree. He was such a little show-off and I am convinced he was posing! Yesterday was difficult. I found it sad leaving Dad at the station knowing I won't see my parents over Christmas. By the time I met Kat at Chocolate Soup, I was thoroughly miffed with everything. However, after a chat and some choccy I felt a bit better, and we all plodded down to the train station. The journey back was uneventful, although I did shed a few tears from time to time. I really find it difficult being so far from home and I miss the connection that I had with Edinburgh. It's hard to make the same connection with London. At 4am, this morning I was woken up by pains in my stomach. I felt like I was being stabbed. However, it did soon pass and I got a little more sleep. Typically, my stomach has been yucky and gurgling away unhappily all day. So, it’s no bellydancing for me tonight. I might think about making some Christmas cards instead. Recently, I’ve been feeling a bit apprehensive about not spending Christmas with my parents. That’s not to say I don’t want to spend it with Graeme. However, I do worry that it will be crap, as I’ve never done Christmas myself before. I suppose I just want everything I had at home but with my own slant on it. To get the ball rolling, I bought some lovely Christmas themed plates on Saturday. They’ll look great with mince pies and a mug of mulled wine! I also bought some gorgeous material to make some Christmas place-mats – it’s all silvery with little Christmas trees in white and red on it. It’s going to be my project to help me learn how to use my sewing machine. Once I get the place-mats done, I might go and buy some lovely red material to make a tablecloth as well. I really can’t believe all the beautiful materials that the Oxford Street John Lewis has. There were chiffons, silks, satins and velvets galore. One of the mannequins was dressed in a gorgeous leaf green satin dress. It will be years before I manage to make anything like that! I mentioned in a previous post that I’ve been a little down and that I’m trying to tackle it through dietary changes and exercise. Well, what a difference one week has made! I bought myself some multi-vitamins and Cod Liver Oil to help combat my vitamin B12 deficiency and up my Omega 3 levels. I’ve also been eating much more healthily adding in more fish and veg, while making my portion sizes smaller. There’s no reason I should be eating the same size of meals as Graeme! After one week of this, I feel so much better. I don’t have the big slumps in energy as I am eating more slow-release foods. I also don’t seem to get tired after eating dinner anymore. Finally, I am sleeping a lot better. To supplement this, I’ve added in some fun exercise. I went out last week and bought a skipping rope, as I can skip quite easily in our living room without breaking anything. It really is good fun but it is so tiring. I lasted about 2 minutes on the first day. Now, I can last for about 5-10 minutes with little breaks every time I stumble instead of jump ;o) I find it very therapeutic as well. Once you get into a rhythm, your mind just seems to focus on that and it’s quite calming. I’ve been trying to add in some different jumps, twists etc too, so that is interesting. It really is amazing how these little changes can make such a big change to your well-being. I am very, very happy to see the American people beginning to fight against their current administration. I hope now we can have sensible debate on issues like abortion, creationism and gay rights without the intolerant attitudes that have been prevalent over the last few years. On Sunday, we went for a walk around a gorgeous lake in some country park whose name I cannot remember. 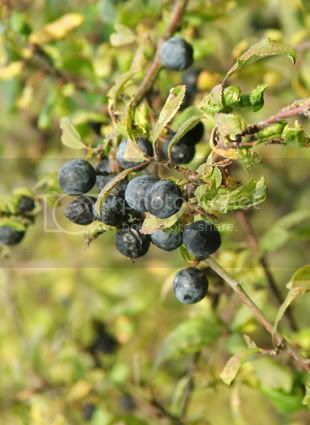 We saw loads of beautiful sloe berries and rosehips. Some of the bushes were heavy with them. There were also some lovely apple trees and oaks. We ended our walk with hot chocolate and cake to replenish our energy. I had the most gorgeous piece of treacle tart. My mouth is watering just thinking of it :o) Then it was off back to Graeme’s parents for a relaxing afternoon and a lovely Sunday dinner. All in all it was a thoroughly enjoyable weekend.